The Institute started the M.A. 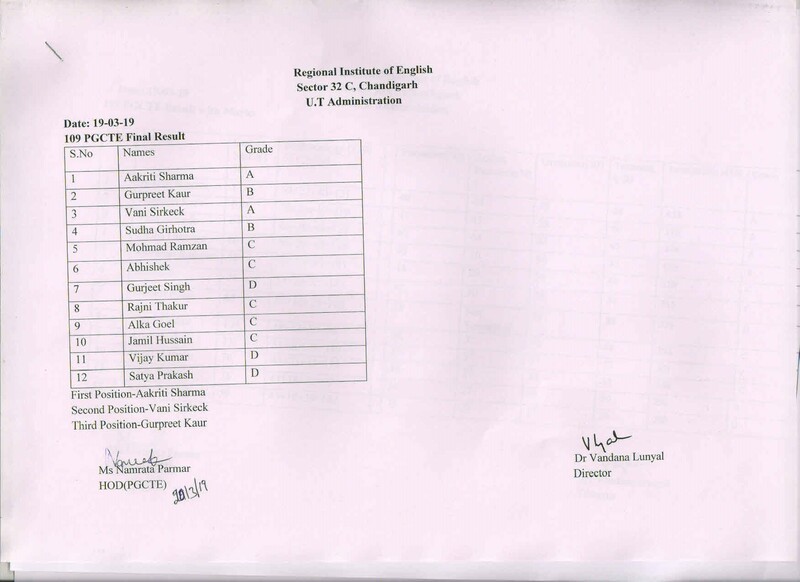 English Programme in the 2010-11 academic session with 30 seats in affiliation with Panjab University, Chandigarh. One of the few Institutes in the region where the MA English students have a Language Lab allotted exclusively to them with language software and round-the-clock internet facilities. In-Service Staggered Teacher Training Model has been piloted by RIE under the CPD programme in the academic session 2016-17. This progarmme works by offering or producing unique staggered course conducted over eight months which will keep them oriented and updated about the course content both while attending the course at the Institute and while away from the Institute. The Institute organizes short need based courses for school teachers at all levels in collaboration with SSA/RMSA Chandigarh, Punjab and Haryana annually. They are imparted new methodologies in the field of teaching English in these programs keeping in mind the regulations and guidelines set down by the NCF. This three month in-service course is for trained graduate/post-graduate teachers of English, working in secondary and senior secondary schools in the northern region. The course aims at imparting knowledge of the structure of English through Linguistics, Phonetics and Grammar and Usage of English along with enhancing Computer Skills of the trainees. The course also aims at sensitizing the participants to Research Skills leading to Material Production (print and video) that can be readily used in the classrooms. Since 101 PGCTE Course onwards, the Institute has taken the initiative to offer a blended mode of PGCTE Course. The first mode constitutes an on campus mode, the duration of which is eight weeks. This mode is also called a face-to-face mode as the trainees enjoy the benefit of improving their performance and competence by being in touch with the faculty on a day to day basis. The second mode is called an online or off-campus mode. The duration of this course is five weeks. This bifurcation is designed to make the duration of course more comfortable, particularly for in-service teachers. .“I Can” Club was initiated by the Institute to give a platform to the students undergoing C-TOSS in government schools of Chandigarh administration. It focuses on preparing students for effective public speaking in English language through various activities conducted inside and outside classrooms. This is a 120-hour training module to develop skilled professionals for the industry. The course aims at imparting training in English Communication Skills, Interpersonal Skills, and Computer Skills to job seekers thereby enhancing their employability skills. For this, the doorstep education model has been adopted and is being delivered at government colleges to around 3000 students annually.